I've read all of Dan Brown's books, so I knew roughly what to expect from this latest installment in the Robert Langdon series. I was a little anxious as I loved Angels & Demons (A&D) and The Da Vinci Code (DVC) but was massively disappointed by The Lost Symbol (as stated in my review). I actually really enjoyed this book. It starts of en media res with Langdon waking up in hospital and he is soon thrown into a race across Florence trying to solve various riddles while evading the people trying to capture/kill him. Because it starts in the middle of the action and you don't know what is going on due to Langdon's amnesia, I became gripped really quickly and wanted to carry on reading to find out what happens next. I'll admit my attention waned a bit in the middle but it picked up again in the last quarter of the book, and the ending really saved this book for me. It was really dramatic and exciting, although I'm not entirely sure about certain aspects of the ending: I wasn't sure about the idea that all of humanity has had their DNA changed so that 1/3 of us is now sterile. While it would resolve the issues and stuff and provides an ending that keeps everyone happy I guess, I dislike the idea that Dan Brown has 'changed' us all. I dunno, I just didn't like it. It was just too weird and dramatic I guess. Also: I hated the little kiss Sienna and Langdon had. I'm glad they didn't have a huge romance throughout the novel but the fact they had the kiss for a touch of romance was just... ugh. 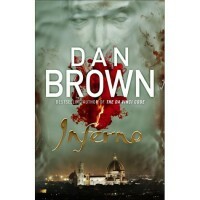 If you've read any other Dan Brown books though you'll know exactly what to expect from this one. Langdon is the same as he usually is, knowing everything he possible could need to to solve the mystery - what a lovely coincidence. And again this book involves a race across a city (European again this time) trying to solve riddles and mysteries. It's very similar to his other books so if you're looking for something original, then this is not it. Having said that, I didn't mind particularly and I liked the slight change up with the en media res beginning and I felt it shook things up a little. It got me hooked early. But I am a bit sick of Langdon. Dan Brown continues to use him because of the popularity of DVC and A&D, but it's just a bit silly really that Langdon just happens to know pretty much every possible bit of information he could need to solve these mysteries. It just seems a bit lazy to me, and I wish Brown could write a mystery like this but with a radically different main character who isn't similar to Langdon. Brown does have a formula for writing his books (despite how much he says he doesn't) but having hated The Lost Symbol I think because of it's American setting, I kinda don't want him to deviate it from it too much. I would like to see a totally different narrative, but I still think European based mysteries appeal more to me, maybe just because Europe has a lot more history than America. I dunno. It seemed well researched and was saturated with information and history (perhaps too much though, I did get bored with constant descriptions of things and their history). Although I have heard that Dan Brown doesn't actually do as much research and isn't as accurate as you might think, which I can see how that could be true. But as I don't know a lot about Dante or Florence or anything else really covered in the novel I can't really comment on that myself. Overall, it's a good enough book if you like Dan Brown and aren't hoping for anything especially original. I enjoyed it enough.